Hurry, Hurry Hurry! Don’t delay! We’ve got big boppers and even bigger guns on the market. Don’t like the price? Wanna haggle? Not a problem. At least it wasn’t a problem for Arizona and pitcher Dan Haren who was traded for a handful of rubbish. But our July deals are certainly not going to end at Dan Haren although perhaps Arizona should stop trading if they don’t know what they’re doing. Some will go and some will stay. That’s just the nature of the beast. I think there are 5 guys that will almost certainly have a new address in the next few days. I think there are also a couple of guys who will be shopped but not moved. P Ted Lilly – The Chicago Cubs are in a semi-rebuilding phase. They have a nice corps of young players but their window of opportunity has closed. The bidders should be Minnesota, Detroit, New York (NL), New York (AL), Boston and Chicago (AL). If the Cubs are smart and judging by some of the deals in the last 2 years that is in question, they will get as many young prospects as they can for Lilly. My favorite of the group to land Lilly would be Detroit. They have a solid minor league system and a bigger ball park. They could package a combo of hitters and pitchers for Lilly. Fukudome or Theriot could also go with Lilly in a mult-player deal. 1B/DH Adam Dunn – I think Dunn is done in D.C. Adam’s offensive stats have been coming down steadily since 2008, but he is still the best power hitter from the left side available. Chicago (AL) has been looking hard at Adam but they would want him to DH more than play field. Detroit is also looking at Dunn but may have to choose between him and Lilly. Another sleeper could be New York (AL). If P Andy Pettite returns from injury soon than the Yanks will focus on hitting, no pitching. The rub is Dunn would be a bench player/DH most of the time with very little play at 1st Base and OF. I think the Tigers will find a way to land Dunn to replace Ordonez in the lineup and ensure the White Sox don’t get him. 3B/DH Mike Lowell – Mike has certainly had better years. Mike who is currently on the DL will come off of it shortly. Will he come off the DL with another team is the real question. Texas, Detroit (AL), Minnesota and Anaheim are all looking at Lowell. Lowell won’t go to Detroit unless their bid for some of the bigger free agents fails. Minnesota is a long shot but they are interested in landing a veteran bat off the bench for the playoff run. Anaheim could make the move but they have their eyes on a couple of other hitters. I think the winner in the bid for Mike will be Texas. The Rangers have been flirting with Lowell since the off-season. They would greatly value his leadership in the clubhouse come playoff time. Not too mention the Rangers don’t have too much too offer for Lowell due to the Cliff Lee deal. Should still work out because Boston probably won’t ask for too much for him. 1B Derrek Lee – Ideally the Cubs would love Lee to stay on for 3 or 4 more years and retire as a Cub but the team is in no position to go that route. Lee is underperforming and the Cubs are out of the race. That being said their are teams like New York (AL), Anaheim and Texas. Texas was an early favorite but may not have the players to give to get him. New York is an intriguing location for Lee but the Yankees will be more interested in veteran, power hitters that can play multiple positions. The winner is more than likely going to be the Anaheim Angels. They have shown interest in Lee before and he would actually blend in very well with the group of guys they have now. DH/IF – Jorge Cantu – Jorge has had an up and down year but could be the valuable bat off the bench and guy to give the stars a rest down the stretch for a contender. New York (AL), Texas, San Francisco and Colorado should be in play. Colorado and San Francisco may bid on him but I don’t see either team being serious enough to land him. Texas is only interested if guys like Derrek Lee and Lowell are off of the board. Not too mention Texas has some financial issues so they can’t add too much payroll. I think it comes down to the Yankees. He plays several positions and won’t be a huge drain on the already massive budget. P Roy Oswalt – Roy is by far the best pitcher on the market. He is the Cadillac of pitchers. The only problem is teams may try to short sell the Houston Astros for Oswalt’s services. They look at the Haren situation and they don’t want to get stuck with 4 or 5 marginal prospects for one of baseball’s most reliable and talented pitchers. Philadelphia, New York (AL), Los Angeles (NL) and St. Louis are most interested in Roy’s services. New York had interest as insurance for Pettite. If Andy was going to miss any significant time they would make a run at Oswalt, or Lilly. St. Louis would love to add an ace to a mediocre pitching staff. That type of deal makes them contenders to take the Pennant, not just make an appearance in the playoffs. However, St. Louis always talks big in July but management rarely delivers the big prize. The Dodgers aren’t going to make many moves. There are issues with management and coaching and very few believe this team can make a legitimate run at anything. The team that could land Roy is Philadelphia. They are the only team tossing names out their like Jason Werth and J.A. Happ in any sort of deal. Houston would want some good MLB ready guys in any deal for Roy. A deal for Roy could still happen but it is Philly or bust at this point. 1B/DH Prince Fielder – Prince is a big time power hitter. Although his numbers are a bit more pedestrian this season his value remains high as a big, left handed bat. The teams that are looking at Prince are Chicago (AL), Anaheim and Texas. Now Anaheim and Texas each have some issues with regards to chasing Prince. Anaheim is looking at other players first and may not want to give up a boat load to get a big, out of shaped slugger. Texas has seemed to have lost interest lately and will almost certainly go a different and cheaper direction. The team that has the best shot is Chicago. Another team is almost certain to jump in front of Chicago to land Dunn so they will be on to plan B. Prince would play DH but wants to play 1B long term for his new team. That could be an issue down the road. Chicago would also have to part with at least one if not two top prospects to pry him away from Milwaukee. Chances are slim this goes down but never say never when it comes to Kenny Williams and the Chicago White Sox. Cubs management has forced upon Cubdom something wonderful and that is the soon to be dismissed Lou Pinella. This infectious, puss filled spitball will be thrust from Wrigleyville in about 70 days never to be seen, or heard from, again. 24 months ago I wouldn’t have said this. Then he was manager of the 1st place Cubs. A Cub team that would go on to win 97 games and be favored to win the NL Pennant. How quickly things and opinions change. Since the playoff sweep of 08′ the Cubs have been mediocrely dismal. They have had the players to be much better than .500, or sub .500 in the case of this years Cubs disaster but have failed. He looks old but acts a lot older. He is a lot less fiery. He gets riled up by stupid questions from the media but not from the putrid play on the field. “I’ve given up! I’ve tried everything.” Lou utters from his st-st-stuttering lips. Right then I knew it was time for a change. He had given up hope so why retain his services any longer. Seriously! The Cubs have Trammell on the bench and Brenley in the press box. Give them the last 60 games. Maybe the Cubs catch fire in the last 60 and make a run towards respectability. I think any Cubs fan would be delighted with 82 or 83 wins at this point. It is worth a shot. Let’s face it, the Cubs under “lame duck” Lou will do nothing but remain the same or it could get worse. If that’s the case than gut the team. Lilly, Theriot, Ramirez, Lee, Fukudome, etc. Get rid of as many of those guys as you can and let Lou manage a minor league team for the last couple of months of his career. Is Lou a Hall of Famer? Based on the body of his work he probably is. Has he been a HOF coach the last 22 months? Far from it! The best thing the Cubs could do is spit him out now while they have the chance. But will they do it? It’s the Cubs, what do you think? The sports world had to sit through weeks of “experts” spouting off their theories about King James. Sports talk shows were drawn to it and so were the sheeple. He’s going home! He is going to Chicago! He is going to New Jersey or New York or Miami. And the reasons for their beliefs were, well, down right stupid. We had to listen to Mariotti, Stephen A. Smith and some other hack sports journalists tell us why it would be one city and not another. What started as an exciting free agent process with a lot of really good players like LeBron, Wade, Boozer, Bosh and Nowitzki turned into an avalanche of greed and self-importance. LeBron announced he would meet these teams on his own terms and then have a one hour special announcing his decision. Really? All the great players of ALL TIME in every major sport and this guy needs a show. I surprised LJ didn’t contact USA Network have Jeffery Donovan fired, King James would be the new lead and rename the show Lebron Notice. No wonder the Cavs owner felt the way he did. The Cavs are the home town team. All heart strings are pulling Lebron back but it isn’t about home being where the heart is. It certainly wasn’t about building a championship with a great young team like Chicago. If that had been a priority than Chicago would have made the most sense. Newly signed Carlos Boozer, Noah, Deng and super point guard Derrick Rose would have made for an excellent starting 5. But, he wasn’t interested in a great sports city like Chicago. Or maybe he just didn’t have the balls to come to the team that Michael Jordan built. What was important was greed. What was important was playing ball with his homies Bosh and DWade. What was important were beaches, clubs, babes and no state income tax. After the decision it just made the whole one hour announcement a contrived dramedy. It wasn’t as hard of a decision as he played it. It was about image and getting to hang out in South Beach with his “Rat Pack” for 5 years. Will they win a championship? It is possible if all three ball studs stay healthy and play 45 minutes a night for 82 games. The Heat bench will be unimpressive overall and they won’t be able to make any moves during the trade deadlines. It is the Three Amigos or BUST! And, keeping this team under the cap will be an amazing feat of accounting skills worthy of a one hour special but I have a feeling the Heat won’t have enough left over to support the Boys and Girls Club. Well, the team won’t but I bet Wade, Bosh and Lebron have a few extra shekels to spare. King James is all yours South Beach. Enjoy! 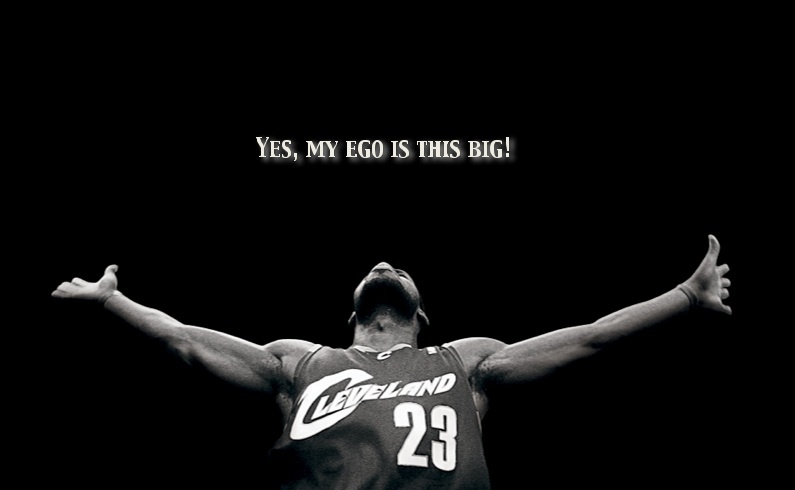 I don’t think you guys have a court big enough for those egos.